Ad impressions on tablets are growing according to the Global AdMetrics Report for Q4 2012. The latest figures from Adfonic show an increase from 9% in Q2 2012 to 14% in Q4, which indicates nearly one in every seven mobile ads was displayed on a tablet by the year’s end. 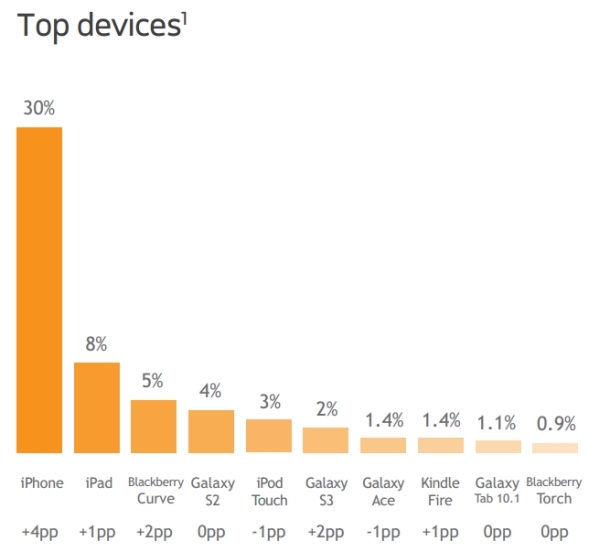 As you’d expect, Android and iOS are still vying for top place in Adfonic’s ranking. Android current edges iOS by two percentage points and has been positioned top for all but the first quarter of last year. However, the gap has narrowed from 8% in the second quarter. Apple’s iPad held more than half of all mobile ad impressions with 57.2%. Its majority share had been cut by six percentage points from Q3. The Kindle Fire was next in line and may have been the recipient of the iPad’s lost share. Amazon’s tablet was up 6% to 9.7%. Victor Malachard, Adfonic’s CEO and co-founder, expects the mobile device proliferation to continue well into 2013. He also discussed how the range will increase as more manufacturers try their hand at producing the devices. “We know that tablets perform well for advertisers and publishers alike so a combination of more devices, with superior advertising performance, can only be good news for mobile advertising in 2013,” he said. 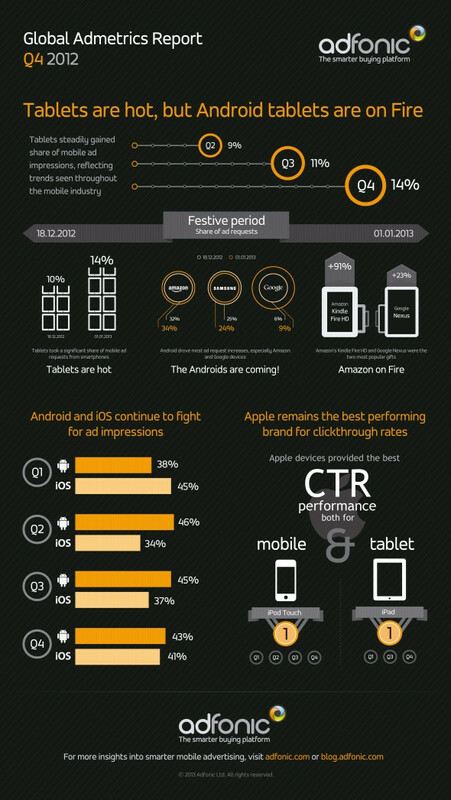 The iPhone held 30% of mobile ad impressions and the iPad followed with 8%. The iPhone’s share is said to be greater than that of the next top nine devices, which is unsurprising given it accounts for an entire product range and not a specific model such as the iPhone 5. Interestingly, Samsung’s Galaxy S2 device had 4% of mobile ad impressions, double its newer sibling, the Galaxy S3, which rallied 2%. The figure could signify that either Samsung has only sold half as many S3s as it has S2s, or that S3 owners are half as likely to click an ad as those with an S2. Adfonic’s report disclosed a changing of the guard for online advertising. 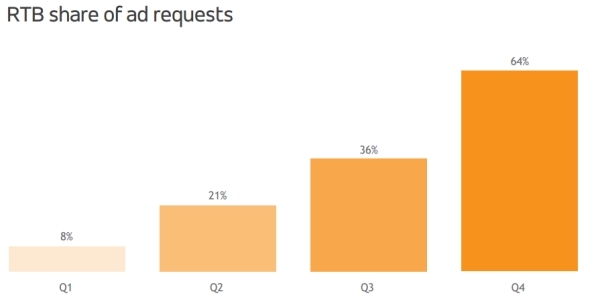 For the first time, the company processed more RTB ad requests than non-RTB, with 64% of requests coming from RTB-enabled inventory. Wes Biggs, CTO of Adfonic, has witnessed more RTB interest from the entertainment sector. He also revealed to A4u how Adfonic’s been partnering with more RTB exchanges, which will have also contributed to the rapid uptake of this display buying method. “RTB is proving immensely attractive to particular types of publishers such as entertainment apps, who make their inventory available to many advertisers by plugging in; and Adfonic continued to expand and enhance its leading mobile RTB offering by connecting to more RTB exchanges,” he said.